The NetApp Endura team took the fight to the WorldTour teams on today’s fifth stage of the Tour of Qatar, featuring Daniel Schorn in the long distance breakaway move and then later massing at the front in the closing phase of the race, but directeur sportif Alex Sans Vega has acknowledged that things didn’t quite go to plan. While the team was both aggressive and ambitious, hitting the front inside the final five kilometres, the riders burned matches that they needed to have closer to the line. As a result team sprinter Sam Bennett was too far back when the sprint started, and had also used excess energy. “Today we again focused on preparing the sprint for Sam. At the same time, it became clear that we need more experience and training to deliver a perfect sprint train,” he accepted. Bennett gained his place on the team following a strong ride in the Tour of Britain. He won a stage and placed second on two others, showing his finishing speed. 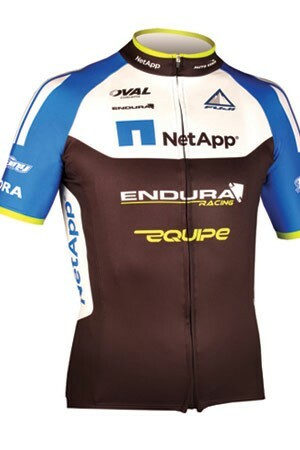 NetApp Endura decided to give him a pro contract and in his first race, Bennett has already shown that he can mix it with much more experienced riders. Fifth on Wednesday and seventh today, he’s determined to try to get something more out of the race on the final stage tomorrow. Sans Vega suggests that the riders will bounce back with a determination to get their timing right and to put Bennett in the ideal position. The Pro Continental team has been given a wildcard place for the Tour de France and is aiming to perfect its sprint team well in advance of that race.